Social workers who evaluate and treat mental health conditions most often see clients with primary psychiatric disorders, or mental disorders that are not demonstrably caused by one or more clearly verifiable medical conditions. For the purposes of this discussion, the term “medical condition” is defined broadly to include the physiological effects of medical diseases, substances, and neurodevelopmental disorders on the onset/timing, persistence, and/or worsening of various mental health complaints/symptoms. • people who are habitually noncompliant with medical advice. Misdiagnosing a medical condition as a primary psychiatric disorder can delay appropriate medical care and lead to serious negative health outcomes. This error in clinical judgment may increase the risk of ethics complaints and malpractice suits on the basis of negligent diagnosis (Shapiro & Smith, 2011). Social workers and other nonmedically trained mental health clinicians, including mental health counselors and psychologists, may be especially vulnerable to this type of error in diagnostic decision making (Rothbard et al, 2009). It can be difficult to reliably identify clients who have a medical (nonpsychiatric) contribution to their mental health complaints/symptoms because primary psychiatric disorder and medical conditions can co-occur and sometimes involve overlapping symptomatology. This is particularly true in elders, where a broad range of medical conditions can present with apathy, irritability, fatigue, cognitive dysfunction, pain, and other somatic complaints (Pollak & Miller, 2011). Findings from routine history taking that have traditionally been understood in psychodynamic, psychosocial, and sociocultural terms can sometimes reflect the effects of one or more medical conditions. For example, the psychiatric complaints/symptoms of clients with a history of life-threatening medical illness are frequently viewed as reactive to the traumatic circumstances surrounding the medical condition and its treatment. A common example from an oncology clinic would be the mental health clinician who comments, “I’d be depressed too if I just had chemotherapy.” However, the frequency of occurrence of medically induced mental status change of varied type is relatively high among clients with serious mental illness (Grant & Adams, 2009). Victims of longstanding domestic violence may report problems with attention/concentration, thinking, and/or daily memory. These can be easily attributable to the emotionally traumatic impact of years of psychological and physical mistreatment. However, such complaints/symptoms may also reflect the effects of subtle cognitive change referable to repeated whiplash and/or minor head trauma. In addition, posttraumatic stress, based only on exposure to psychological stressors, has been linked to organic cerebral change resulting in neurocognitive symptoms (Sapolsky, 2000). Certain aspects of the history that are generally considered red flags for explanation in psychodynamic, psychosocial, and/or sociocultural terms can be misleading and obscure potential medical contribution. These include histories involving disrupted attachments, neglect, mistreatment, prejudice/social ostracism, and recent stressful life experiences. Therefore, this aspect of clinical assessment can be a significant “trip wire” for social workers and other nonphysician mental health clinicians, leading to erroneous diagnosis and inappropriate intervention. Errors in clinical judgment, in this context, can reflect the effect of diagnostic overshadowing where the familiarity and salience of a particular clinical perspective impedes the ability to appreciate a complementary or alternative explanation for the client’s difficulties (Quintero & Flick, 2010). The following is a list of commonly occurring findings obtained as part of the mental health history-taking process. While these findings are customarily (and often correctly) understood in nonmedical terms, they can, in some cases, reflect the influence of one or more medical conditions. • Physical abuse/mistreatment (includes domestic violence): Cerebral hemorrhage or hematoma, hypoxic insult, postconcussive syndrome, and whiplash injury. • Episodic dyscontrol, including explosive/violent outbursts: Neurologic dysfunction affecting limbic and frontal brain systems (includes brain injury, substance intoxication, and sundowning in dementia). • Heightened emotionality and/or religiosity: Seizure disorder affecting temporal brain systems. • Substance abuse/dependence: postconcussive syndrome, delirium/confused state, mild cognitive impairment, dementia, substance-induced anxiety, and mood and/or psychotic disorder (includes substance intoxication as well as withdrawal). • Posttraumatic stress: mild cognitive impairment (includes problems with attention/concentration and short-term memory). • Job failure and/or psychological decompensation following a significant career change/promotion: attention-deficit disorder, learning disorders, mild cognitive impairment, and early-stage dementia. • Impaired coping/social skills: attention-deficit disorder, learning disorders (including nonverbal learning disability syndrome), and autistic spectrum disorder; history of pre-, peri-, or postnatal brain insult. T. M. is a married man in his mid-50s who has been in individual psychotherapy for persistent depressive mood symptoms for the past several years. After an apparent improvement in his mood/outlook over a period of several weeks, he comes to his next appointment complaining of fatigue, low energy, and hypersomnolence. These symptoms have contributed to a recurrence of his depressed mood. Initially, this aspect of T. M.’s recent history was viewed as reflecting new or worsening symptoms of his baseline depression although there were no apparent psychological stressors/triggers that might plausibly explain these complaints. The therapist reviews T. M.’s record and discovers that he has not had a physical examination in three years. The clinician recommends an updated medical screening by the client’s primary care provider. Following a medical evaluation, T. M. informs his therapist that he was diagnosed with anemia associated with colonic polyps. Following the removal of the polyps and resolution of the anemia, his symptoms diminished and he returned to working in psychotherapy on longstanding relationship issues contributing to his baseline depression. A good working knowledge of nonpsychiatric causes and presentations of mental health complaints/symptoms can help social workers and other nonphysician mental health clinicians bring a broader perspective to the history-taking process and avoid errors in clinical judgment based on over reliance on psychological models of diagnosis and treatment. Recent articles address this issue in greater detail (Carroll & Rado, 2009; Kaplan, 2009). — Jerrold Pollak, PhD, works in the medical and forensic neuropsychology program at Seacoast Mental Health Center and the department of psychiatry at Exeter Hospital, both in Exeter, NH. — John J. Miller, MD, is a psychiatrist at Seacoast Mental Health Center and a consulting psychiatrist at Exeter Hospital. Carroll, V. K. & Rado, J.T. (2009). Is a medical illness causing your patient’s depression? Current Psychiatry, 8(8), 45-54. Grant, I. & Adams, K. M. (2009). Neuropsychological assessment has neuropsychiatric and neuromedical disorders. 3rd ed. New York, NY: Oxford University Press. Kaplan, A. (2009). Neuropsychiatric masquerades. Psychiatric Times, 26(2), 6-8. Pollak, J. & Miller, J. J. (2011). Mental disorder or medical disorder? Clues for differential diagnosis and treatment planning. Journal of Clinical Psychology Practice, 2, 33-40. Quintero, M. & Flick, S. (2010). Co-occurring mental illness and developmental disabilities. 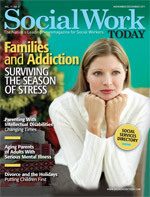 Social Work Today, 10(5), 6-7. Rothbard, A. B., Blank, M. B., Staab, J. P., TenHave, T., Young, D. S., Berry, S. D., et al. (2009). Previously undetected metabolic syndromes and infectious diseases among psychiatric inpatients. Psychiatric Services, 60(4), 534-537. Sapolsky, R.M. (2000). Glucocorticoids and hippocampal atrophy in neuropsychiatric disorders. Archives of General Psychiatry, 57(10), 925-935. Shapiro, D. L. & Smith, S. R. (2011). Malpractice in psychology: A practical resource for clinicians. Washington, DC: American Psychological Association Press.